Since the beginning of times man has instinctively jumped from one object to the next and into open space in need to function and adapt to a constantly changing environment. As a reflex, it is one of the most natural movements of the human body, triggered inherently from the need to attack, gain advantage in combat, escape dangerous animals, dance in rituals, gather food from trees, in celebration or for friendly competition. More importantly, jumping is a natural reflex that can be developed into a skill for advantages and will always be essential to man’s survival. Over time in everyday life and experimenting with his environment man started combining this linear movement of jumping up and down with objects found in nature. As early as the Egyptians, vines were combined with jumping as a form of play. In medieval times, kids skipped through hoops. These movements practiced together to mastery eventually took shape and emerged into an art form that we refer as Jumping rope or rope jumping. Today this ancient activity and training tool has become synonymous with the warriors’ pre fight training regimen and strategy for developing superior fitness. The first concrete evidence of jump rope activity can be seen in medieval paintings where children roll hoops and jump rope down the cobblestone streets of Europe. Although, the exact origin of jump rope activity is unclear. Some date jump roping to ancient China; however, the Western versions probably originated from 1600 B.C. Egypt according to researchers at the Jump Rope Institute. What is known is that jump roping, in some form or another, spread through Europe to the Netherlands, and eventually to North America. Early Dutch settlers were some of the first jump ropers in America. Not surprisingly, one of the more popular jumping games is called “Double Dutch. As stated, the history of rope jumping spans across several thousand years dating back to ancient civilizations. Several historians believe that as Egyptian and Chinese rope makers were busily twisting long strands of hemp; they would jump over them to retrieve the strands. As they continued to develop their skills such as eye to hand coordination,and agility, their children learned to imitate them, and invented their own versions of jumping games. The Australian aborigines were also known for jumping over sticks of bamboo as a form of play. The first solid evidence of jump rope activity can be found in medieval paintings, in which children were depicted jumping through hoops and jumping rope along the cobblestone streets of Europe. Many people, when asked, associate jump roping as a form of pastime play for girls, however history indicates that jump roping was a man’s game. In the 1700s, rope skipping was performed mainly by the male population due to the culture of the day, where girls were not encouraged to perform jumping activities, due to the fact they could become physically injured. It wasn’t until the 1800s that both boys and girls were encouraged to play skipping and jumping games. By the late 1800s, girls became much more involved in jump roping, creating various rhythms, singing and chanting games. Lydia Maria Child included the above selection on how to jump rope in The Girls Own Book, a book published in 1833. Why did girls in early 19th-century America need instructions on how to jump rope? Why did Child’s feel the need to caution girls? Ever since boys had first begun to jump through hoops and with ropes on cobblestoned streets in 17th-century Europe, jumping rope had been considered a game not suitable for girls. By the early 19th century, the emergence of a new gendered ideology that promoted passivity and domesticity appeared to reinforce earlier proscriptions that limited girls’ play. Yet the recommendations of child-rearing advisors suggest that many believed that active play was good for girls. Along with Child, other experts predicted that open-air exercise would improve girls’ dexterity, scientific inquiry, patience, diligence, as well as strengthen their characters and rid them of debilitating medical conditions. In contrast to the innumerable depictions of idealized girls playing passively indoors, real girls engaged in unfettered and vigorous games in fields, rivers, quarries—even cemeteries. Girls’ new freedom of movement had been made possible by recent changes in clothing fashions. Girls’ shorter dresses (“frocks”) enabled them to skate, sled, run, and romp. Yet it was the introduction of “pantalettes” or “pantaloons” (the loose pants worn under dresses seen in the above illustration) that enabled girls to make the game of jumping rope their own. Elsewhere in the U.S. and around the world the game has had different methods and meanings (e.g., Chinese jump rope). In the slave South, African-American girls transformed jump rope rhymes originally from Germany and England into ones with more transgressive meanings about slavery’s ills. Throughout the years, jump roping has evolved into not only a form of exercise, but a competitive sport. Fitness Centers and Gyms throughout the world incorporated jumping rope as an essential form of a cardiovascular workout, integrating it into various exercise routines such as kick-boxing, boxing, yoga, and pilates, as well as many other forms of exercise. Research has also shown that jumping rope for 15 minutes burns as many calories as jogging for 30 minutes, thereby making it a great tool in weight management. Sport coaches use jumping rope as a warm up and conditioning exercise to improve overall athletic performance. Physical therapists may prescribe it as a low impact exercise to rehabilitate injured knees and ankles. Jump rope organizations and clubs have sprung up worldwide, where serious competitions occur, and where jumpers have developed a number of various intricate jumping moves. Throughout United States history, two organizations, the International Rope Skipping Organization (IRSO) and the World Rope Skipping Federation (WRSF) evolved. The IRSO focused mainly on stunt-oriented, gymnastic and athletic forms of jump rope moves, while the WRSF recognized and focused on the poetic and graceful form of jump roping. These two organizations later merged to form the United States Amateur Jump Rope Federation (USAJRF) in 1995. Not long after they were renamed USA Jump Rope, which remains the main organization for the sport of jump roping, and is composed of hundreds of teams and jumpers from all over the country. The members attend numerous workshops and training camps, as well as perform both for public enjoyment and various degrees of competition. The sport and game of jumping rope has definitely evolved from the schoolyard game of chanting rhymes. It is true that jumping rope on the playground is still a popular pastime, however many more utilize the activity for improving their fitness, and competing internationally, where many of their routines are beautifully choreographed to music and demonstrate phenomenal skill and foot movements. Jumping rope takes strength, endurance, focus and patience, but more importantly it takes a jump rope and a happy attitude to just have fun. Child, L. Maria, The Girls’ Own Book; New York: Clark Austin & Co. 1833. Jacobs, Harriet Ann. Incidents in the Life of a Slave Girl Written by Herself.A full-text version is available at Project Gutenberg, http://www.gutenberg.org/etext/11030 (accessed December 23, 2013). 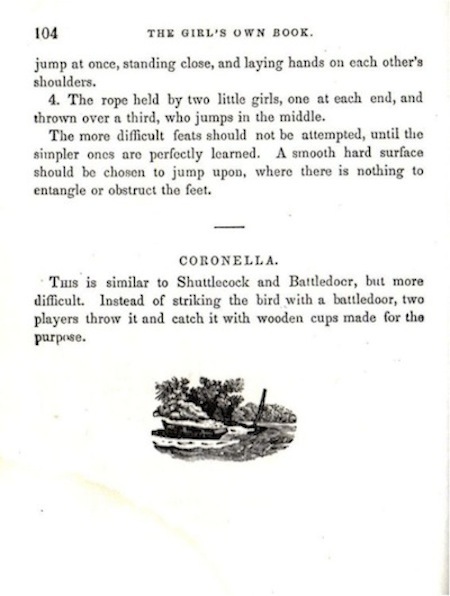 “Jumping Rope [Advice Book],” in Children and Youth in History, Item #340, http://chnm.gmu.edu/cyh/case-studies/340 (accessed December 23, 2013). Lee, Buddy; Jump Rope Training – 2nd Edition, Champaign, Illinois, U.S.A.: Human Kinetics, 2010. Stephens, Lisa; “The History of Jump Rope,” www.sportinglife360.com/index. Jun 7, 2009.